No, sorry. No emergencies here. I meant May Day… as in the first of May. So many good things are ramping up around here, that there needed to be some exclamation in the title, even if it was a little misleading. The warm weather has (mostly) moved in around here – and though we have a pesky cold front of two that keep lingering like guests who simply will not take the hint, the warm weather is coming on, regardless. I will be partaking in not only the first camping trip of the summer on May 1, but it will also be my first ever writer’s retreat! A few fellow authors and I will be heading out into a relative corner of nowhere (because the middle is very mathematical) to spend a weekend focusing on nothing but the craft. I plan to have some very good things to say about the amount of work I’ll be putting into the weekend, as I have been spending the time gearing up to it in research for the story I am working on next. And maybe because it’s a milestone, I feel like I need to set the bar high. Is twenty thousand too many words to produce in a weekend? Not enough? It’s a huge story I am proposing for the next one, so I want to get a good start with this weekend of uninterrupted writing bliss. Perhaps it is a lofty goal, but I think that’s the point. If I want to be a writer, I need to write, right? Regardless of the word count, I want to feel it in my arms… without the carpal tunnel. So what of the other projects? House of Thirteen is waiting patiently in a short line before it will be in the hands of The Editor. Once The Editor gives me the OK, I can send it out for beta reading (a small group of people who will read the book to further proof it for errors, as well as telling me what does and does not make sense in the plot). From there, it will be ready for formatting, and then out into the universe while I hold back tears of pride. Threshold has not been seen by an editor at all yet, and is napping until it’s appointment comes. I haven’t even started work for the jacket yet, but that will come in due time. I have also given some actual thought to some merchandising at this point, and have started actual work on such things. While I haven’t actually gotten around to putting a store together yet (one thing at a time), I do have designs to launch one. In the meantime, merch will be available at all of the face-to-face events as they occur. I am happy to say that the wonderful Chicalookate is working with me to make some beautiful fridge magnets (or locker magnets? where do you keep magnets?) and notebooks emblazoned with Brian Ritson’s beautiful cover designs. It’s going to be a very exciting summer! 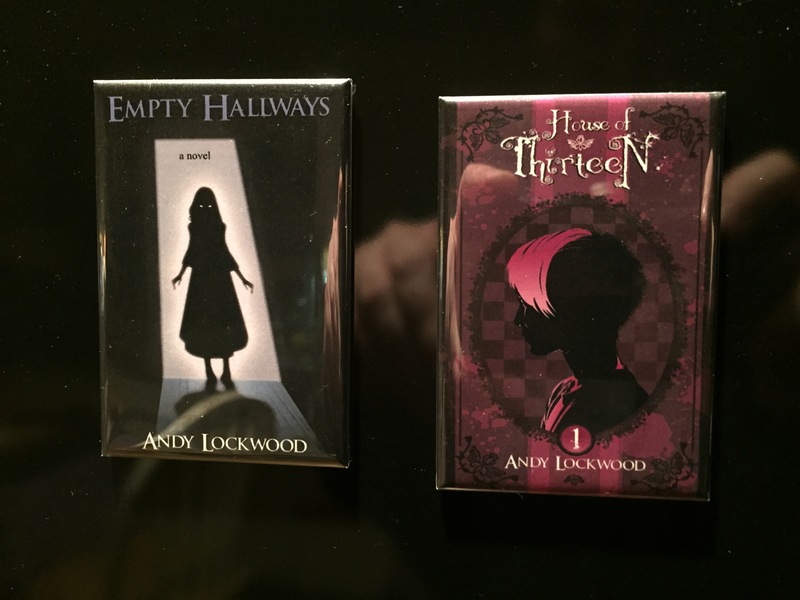 This entry was posted in Announcements, Empty Hallways, House of Thirteen, Reflections and tagged adventure, andy lockwood, announcement, author, books, Brian Ritson, chicalookate, cover art, Empty Hallways, horror, House of 13, House of Thirteen, magnets, May, May day, merchandise, michigan weather, Threshold, writing retreat by randomgauge. Bookmark the permalink.